Ice breaker! As a literary double-act of sorts, who are your favourite famous duos? You’ve mentioned “ice” so of course all we can think about is Ben and Jerry… OK, definitely not Romeo and Juliet because that didn’t end well, and not Sherlock Holmes and Watson (because equal collaborations are much better than boss-and-sidekick ones). Maybe Shaggy and Scooby Doo? They had a pretty equal partnership we feel. Another literary mother-daughter double act that springs to mind is Zizou Corder, author of the Lionboy trilogy – also known as Louisa Young and Isabel Adomakoh Young. What do you think it is about parent-child collaboration that makes for good storytelling? Parents and children tell each other stories all the time. They make each other laugh and wonder at the things they make up; shared stories grow out of conversations. We always had long running and frankly odd make-believe sagas of one sort or another on the go (with far-from-realistic plot lines, and usually involving accents). In one way, writing these shared stories down is just taking it one step further. One of the hardest things about collaborating is feeling exposed when you share work, and that’s much easier when you already know each other very well – you’ve been doing it for years. Has it been a smooth ride, sharing such a close home, creative and work life? This question made us laugh! No! Nothing is ever a completely smooth ride. We’re mum and daughter, we have loads of squabbles but weirdly, very rarely over writing. Maybe because it’s not personal? We get really stuck in to changing and redrafting each other’s writing, but it’s not like criticising what someone is wearing – this is really constructive. And we’ve worked out the way which works best for us: we gossip the plot together and then go and write separately and email each other (home is London, but Honor is at Uni in Oxford). Jodi Picoult and her daughter, Samantha Van Leer, say they work together all day long in the same room – we would KILL each other! But seriously, we do have a lot of fun and it’s lovely having someone to share it all with. Do you have any top tips for collaborating on creative work? Listen to each other (it won’t be fun if it’s just one person being pushy about every decision). Be honest with each other, but don’t forget to be nice! Don’t feel that you have to write side by side with someone, agreeing every word in perfect harmony! There are lots of ways to collaborate, try and find what works for you. Experiment. Don’t forget that, even if you’re writing on your own, it’s good to get used to showing people your work and seeking help and advice. Every single published author, whether they say they collaborate or not, gets lots of help before their book hits the shelves. Even JK Rowling has an editor! Most of our young writers are at primary school; if you could go back in time and give one piece of writing advice to yourself at that age, what would it be? Perdita: I’d tell myself to have fun experimenting. To try writing lots of different things – sad and funny, ghost stories and mysteries, poems and plays. Honor: I loved making up stories at school but because I’m dyslexic and a terrible speller, my work used to come back covered in red pen. I would tell myself not to stress, and that the stories were what mattered the most (and I’d award myself a whole packet of Oreos for not giving up). 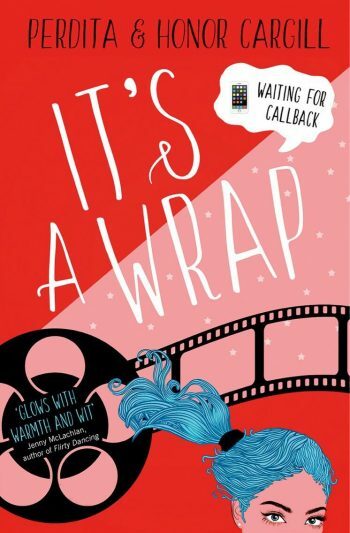 You can find out more about the ‘Waiting for Callback’ series, Perdita and Honor at their website.